Selecting the right kind of hairstyle for your face shape is just as important as choosing the right wedding gown for your body shape. Wedding photographs last a lifetime, so it is worth choosing a hairstyle that will stand the test of time. Deciding on a wedding day hair-do can often prove as difficult as choosing the right dress. What's more, for brides getting married in a tropical climate, additional hair care challenges need to be considered, whether it's avoiding a windswept look or an elaborate style that drops in the heat. If you choose to tie the knot in one of Thailand’s luxurious private villas, of course, you can hire the services of a hair stylist to help them look their best. Coupled with a little research on your face shape and styles that flatter it, you will be proud of your wedding photos for years to come. The first important step to deciding your wedding hairstyle is making sure you know what face shape you have. If your cheekbones are approximately the same width and length of your face, and you have a soft jawline, then you are a round-faced beauty. Radiant round-faced brides that want to keep their hair down should go for a sweeping side parting to alter the focal point of the face’s length to create the illusion of a more oval shape. 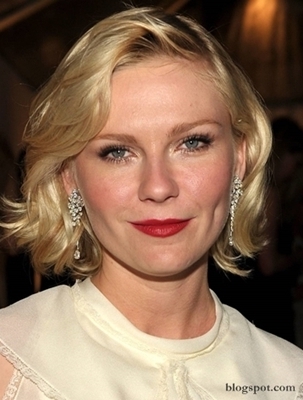 A few waves, like Kirsten Dunst’s, can add even more glamour to your style. A side-parted ponytail is perfect for round-faced brides who favour an up-do. Heart-shaped ladies tend to have a high forehead and cheekbones, with a face that tapers in at the chin like Reese Witherspoon’s. For an up-do, an off centre parting with elegant braids will open up the face, while a texturised bob that falls to the area around the chin like Reese’s will create balance. Lucky oval-shaped ladies can get away with just about any hair they like, as their features are already proportionate. An oval-shaped face has a width that is approximately one third less than the length of the face, with no harsh angles along the hair or jawline. In terms of up-dos, oval-shaped ladies can pull their hair back into any kind of style and let the perfectly proportionate features of their face do all the work. Alternatively, a centre parting with soft waves cascading down over the shoulders is both feminine and classic. For long hair that remains down throughout the day, a small spritz of dry shampoo every now and then will ensure that the heat does not get the better of your hair. A square-shaped face has a forehead and jawline roughly proportionate to each other, which creates four corners to the face. For ladies lucky enough to rock these striking features, a soft low chignon with some loose strands around the face will balance out any harsh edges. For brides who would prefer to keep their hair down, a long straight style like Gwyneth Paltrow’s will also soften any hard edges of the face, and a centre parting will take attention away from a strong jawline. For ladies with longer and narrower faces and striking cheekbones, like Sarah Jessica Parker, there are a number of options to maintain elegance and glamour. To keep it cool and simple, a topknot at the upper back part of the head is a classic look. Alternatively, luscious waves will add roundness and width to the face, and tucking the hair behind one ear will add even more width. SJP makes use of a striking bow to balance out her striking features, and draw attention to her excellent cheekbones.